NEW DELHI: The weekly Doordarshan programme Earth Matters, produced and directed by renowned wildlife and conservationist filmmaker Mike Pandey, has been awarded the first "Golden Giraffe for conservation" at the International Wildlife Film Festival in Albert, France, for spreading awareness about conservation through the visual media. The programme has already led to the formation of about 140 Earth Matters Clubs being set up all over the country with people actively undertaking programmes like planting trees or ensuring water conservation. Even blogs have been created to exchange information about programmes that can be undertaken. Pandey is the first filmmaker to receive the world‘s top environmental awards ? the Green Oscars ? thrice. Speaking at the Presentation ceremony recently, Jean Pierre Hue who is Executive Director of the 18th Festival International du Film Animalier, said only three names had been shortlisted of the many received, but Pandey was selected as his work and the difference it had made put him head and shoulders above the others. He noted that he was aware of the tremendous outreach of India‘s most popular wildlife and environmental conservation programme on television, ‘Earth Matters‘. It had taken information to places where none existed before... benefiting millions across the country and especially neighbouring countries and parts of the world. Keanan Smart, President of the Jury and head of National Geographic‘s Natural History Unit, said: "I cannot think of any other name in the world whose work has achieved so much, not only in India, but internationally." In his acceptance speech, Pandey said: ‘I believe that conservation cannot happen from just one corner of the world but has to be a global effort. I am glad Earth Matters has shown the way and taken a lead in conservation and sharing value based information films which have been recognized by the world community. I hope that this will further the cause of conservation. I thank my national broadcaster Doordarshan for supporting the only wildlife and environmental series in India and which has been running for nearly nine years. The National public broadcaster has been successful in its mandate in carrying information and education where it is urgently needed - rural India and the youth across the country." In an interview, Pandey told indiantelevision.com that around 300 e-mails and almost 4000 letters are received every week by the programme, telecast at 11 am on Sunday mornings on DD One and repeated several times in the week. He said the next few episodes of the programme will concentrate on the Siddhis, a wandering tribe that owes its origins to Africa but whose members now leave peacefully among lions in areas in Karnataka and Gujarat. Pandey said he had devoted six episodes earlier to the issue gripping environmentalists all over the world: global warming. The episodes dealt with Global warming and greenhouse gases, agriculture, rising seas, rivers, public health and temperature trauma respectively. Back home earlier this year, Pandey had received the highest and most prestigious wildlife honour in the country when he received the President?s ?Rajiv Gandhi Wildlife and Environmental Conservation Award? for his path-breaking work. In 1994, Wildscreen Panda Award, also known as the Green Oscar, was given to him for his film The Last Migration - Wild Elephant Capture in Sarguja. In 2000, his film Shores of Silence - Whale Sharks in India, won the Green Oscar for the second time. The film also led to legislation and the ban on the killing of whale sharks on Indian shores and global ban at CITES in November 2003. In October 2004, he won the Green Oscar for the Third time for his film Vanishing Giants ? a story of his passion and involvement with elephants. This film also led to the ban of cruel and outdated techniques of elephant capture in India and a change in the concerned law. Pandey is also the first filmmaker to be awarded the prestigious United Nations Vatavaran International Award for Outstanding Achievement in Global Conservation, the Prithvi Ratan or ‘Son of the Earth‘ at the Vatavaran Film Festival in November 2003, for his outstanding contribution towards generating awareness which led to the conservation of a global heritage - the Whale Shark. Under the banner of Riverbank Studios he has created some of India‘s most popular programmes like Earth Matters and Khullam Khulla and has also directed innumerable other films that have won countless awards - both national and International. In 2004 Pandey brought honour to the country with his Green Oscar nomination for ?The Filmmaker for Conservation? Award - one of the highest awards at the Wildscreen Film Festival ? bringing India at par with the world?s top makers of films on natural history, wildlife and environment. At a special ceremony to commemorate 100 years? 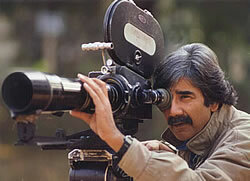 history of wildlife filmmaking at Wildscreen in 2006, Pandey was the only Asian to figure among six global giants like Sir David Attenborough and Mike Salisbury for wildlife film production over the last 100 years.